My son turns 28 today and feel so proud to be his mummy or Mindoo as he calls me lovingly. Initially I though of making something sweet for his birthday, as he definitely has a sweet tooth just like the rest of the family, but then I thought I had to do something different. Niku as we all call him, loves trying out new cuisines and food. Though he is not in Mombasa with us to celebrate his birthday, Ajay and I celebrated by having Navajo fried bread or Navajo tacos as they are called. I loved the new recipe and had to blog it immediately. Hope you folks like it. Try it out. I can’t wait to make it for Niku. Am sure he will love it. Navajo fry bread or tacos is the traditional bread of the Navajo people in America. According to the Navajo tradition, fry bread was created from the ingredients ( flour, lard, sugar, salt) given by the US government when the natives were relocated to Bosque Redondo, New Mexico from Arizona in 1864. 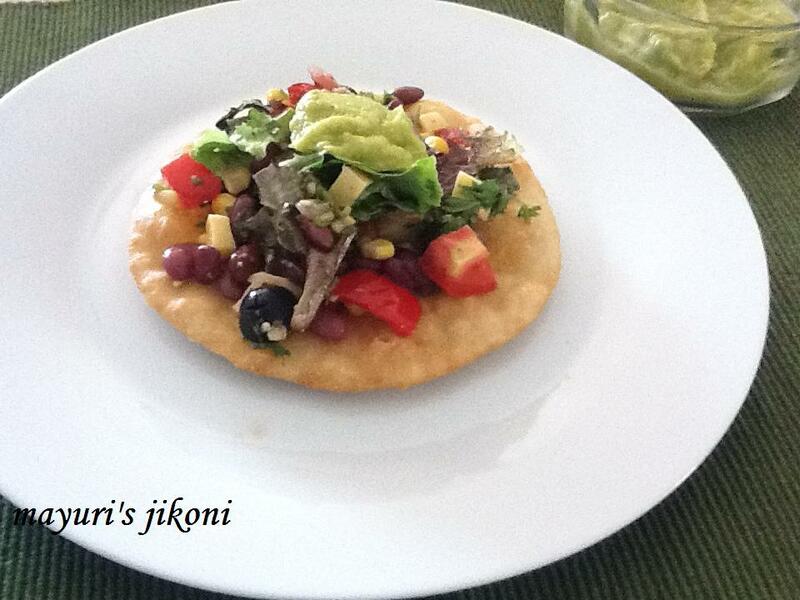 Navajo fry bread or tacos are used for breakfast, lunch or dinner. The toppings can vary from meat, vegetables to just simple honey butter. I got the recipe from cookingclassy.com for the bread and made my own topping and a few changes. Sieve the flour into a bowl along with the baking powder and salt. Add the yeast and mix well. Add the warm milk and make a dough which is not too soft. Take little oil and rub around the dough. Cover the bowl with a cling film or plastic sheet and let the dough rest for 1 hour. Divide the dough into 12 parts. Using extra flour, roll out the ball into a circle of nearly 6 inches in diameter. Keep it on the side and roll out the other balls of dough. Using the point of the knife, make tiny slits all over the rolled out breads or prick with a fork. Heat some oil in a frying pan, wok or karai for deep frying over medium heat. The oil is ready when a small piece of dough put in the oil rises to the surface immediately. Fry the bread till both sides are light golden brown in colour. Put the fried bread in a colander to drain out the excess oil. When it is hot, add the cumin and carom seeds. Add onions, garlic and sweet pepper and stir fry for a minute. Add the corn and beans and mix well. Add chilli powder, oregano and mix well. Let the mixture cool down completely. Just before serving, add salt, pepper, olives, cheese, salad leaves and tomato. Top each fried bread with the topping. Add a dollop of guacamole, sour cream or salsa. You can vary the topping according to your choice. Use chile, refried beans, other salads etc. Remember to rest the rolled bread for 5 to 10 minutes before frying. I lay it out in a row so I fry the first rolled one first. By the time you reach the last one, it has rested for 5 minutes minimum.